Normally our theme is family type things/activities but as zombies......dinnertime, family bbq, sightseeing, breakfast in bed, bath time, etc. We had the best time taking the photos. I found a fence that was actually half a fence. It made it so easy to run stick my arm through the gate to take a pic and run back to the camera to see what it looked like. All done with a tripod and remote! Easy prep for props. Probably the easiest I've ever done besides 2009 graveyard photoshoot. We only brought severed arms and signs. So we are in the process of taking the photos when I see a little girl about 4 years old by herself in the backyard playing. Fearing we would scare her I went to the front of the house (in make-up) to let the parents know we were outside. So excited and intrigued the whole family came out including another younger little boy. So in between growling and moaning during the shots (to get into character) I was running back and forth to the camera in a super sweet voice saying, "Aren't we so silly!?" "I'm going to tickle them with my funny spray" (spray blood when they needed it freshened.) LOL!! Then the boys would giggle to try and show them we weren't scary. The family loved it! The little girl asked if she could hold one of our severed arms. "Of course sweetie!" So funny! 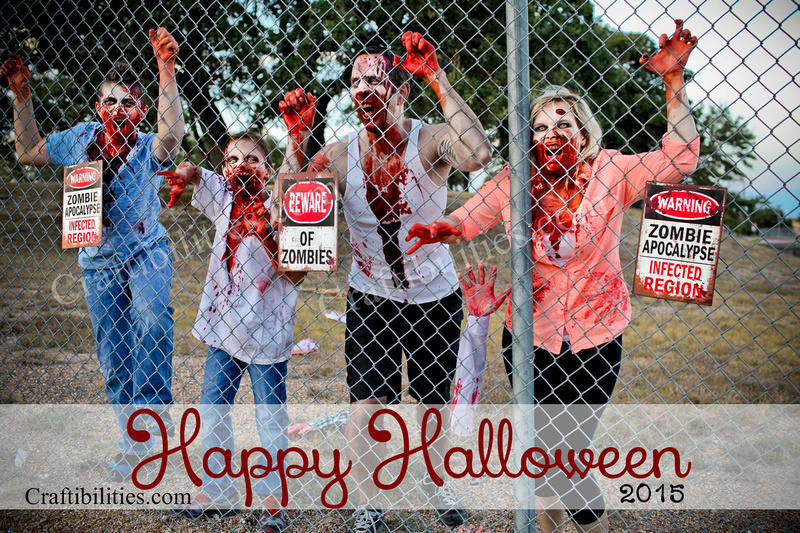 Okay, here is our annual family zombie photo! EEEEEEeeee! It's so awesome! Check out my youngest. He really wanted his jaw to be missing or that it fell off. The things kids ask for. Lol!